LAWRENCE — As far as parish construction projects go, phase two at St. John the Evangelist Parish here was a moving experience. 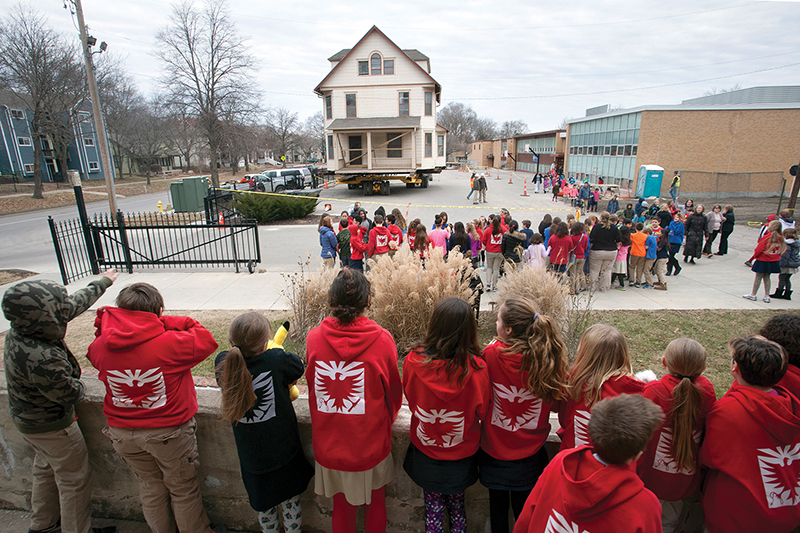 On Feb. 1, the former convent was moved from its location on the west side of the school and facing Kentucky Street, to a new spot adjoining the Simon Parish Center facing east on Vermont Street. Although the new foundation had been poured last November, moving the former convent and setting it down only took slightly more than three hours. B.A. Green Construction was the general contractor of the project, and Patton House and Building Movers of Paola transferred the structure. St. John the Evangelist Parish and School have been undergoing a three-phase capital improvements project for about six years. The first phase, completed in 2013, was the middle school addition. More than a year ago, the parish did a feasibility study for phase two, said Samantha Romero, St. John the Evangelist Parish director of stewardship and development. The school needs a full-size regulation gymnasium and new office space, and the best site for the planned structure at the landlocked parish was the site of the former convent. Originally, the plan was to demolish the former convent and the Simon Parish Center — both houses built more than 90 years ago. The architect’s wife came up with the idea to move the former convent. Not only did it save both buildings and the tree, it saved money. The former convent housed Sisters of Charity of Leavenworth who taught at the school. The last Sister of Charity who lived there was Sister Susan Yerkich, who died two years ago. No other Sisters were available to teach, so the convent was used for office space. The revised phase two plan calls for moving the former convent next to the parish center, remodeling the former gym into a performing arts and event center, and building a new full-size gymnasium. The total cost of phase two is $3.1 million. The third phase — far into the future — is expanding the church, said Father Jeff Ernst, OFM Cap., pastor.